Some tourist sectors of the Iguazú falls were closed yesterday due to the effects of heavy rain in southern Brazil and in the province of Misiones in Argentina. Several river settlements were also evacuated yesterday and nearby provinces put on alert as water levels in both Iguazú and Paraná rivers rose at an alarming rate, leaving their reservoirs at maximum capacity. A daily average of 100mm precipitation over the last ten days in the littoral areas of the falls provoked a high increase in water levels in the Yacyretá dam, on the Argentina-Paraguay border, forcing it to release more water and worsen the rising water levels downstream. A water flow 11 times the norm has been registered in the Iguazú river whilst the volume of the Paraná river is believed to have increased three-fold. In the province of Corrientes, the rise in water levels of the Paraná river has already affected over 30 families who have had to abandon their homes and look for shelter in a safer area. The number of evacuations is expected to multiply over the next couple days.In the Chaco region heavy flooding is expected as well as the inundations of roads, while a state of emergency was declared in Santa Fe, where the rise of the Paraná river is expected to have an impact lasting several weeks. 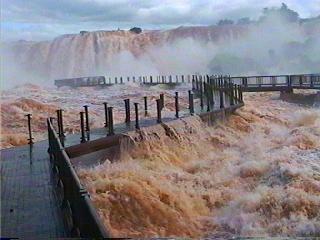 National Park authorities have implemented emergency protocol has been put in place in the National Park of Iguazu, designed to protect the internal infrastructure and announced that “the Garganta del Diablo circuit – the park’s most famous attraction – remains closed today” as the walkways are considered unsafe. To avoid the total destruction of these, as well as the safety of visitors, they will only be re-opened once water flow goes back to its normal level. The remaining circuits of the park remain open and are functioning as normal, with the higher water levels making the Iguazú Falls look even more spectacular. Today, there have been 23 visitors (51 hits) on this page!